Everyone needs to edit images at some point, but not everyone has the time to learn super pricey wizbang image editing programs. This is why we created Acorn. Add text and shapes to your digital pictures. Combine images together to create your own. Work with layers to touch up your favorites or make something new from scratch. Do all this and more with Acorn. All of the tools condense into one easy to use palette to keep your screen uncluttered and inviting. Easily move the palette around if it gets in your way, or press the tab key to make it hide. Use layers and blending modes to make the most of photo editing by allowing easy placement of text and other objects without destroying the picture underneath. Layers allow you to try things out, and change your mind later on. Acorn comes with online documentation and tutorials, so you don't have to learn by yourself. Acorn's text tools give you control over text while maintaining an easy to use interface you expect from Acorn. Everything from bold and italic to kern and ligature. There's even spell check, because we need it. Since Acorn's text tools build on top of Mac OS X's, you get full unicode support, and rich text formatting. Acorn features brushes that let you draw, scribble, and sketch right on your image. Use a trackpad, mouse, or even a tablet. Acorn has everything you need for making pretty doodles, and even has nifty math to keep those lines looking smooth. The Brush Designer in Acorn will help you make custom brushes, and will even redraw your test lines in realtime- watch your brush strokes change as you change settings such as flow and size. Use layer masks in your image to block out unwanted areas of your image or to expose layers below. Acorn has all of the filters you're looking for, and even includes a great interface to chain filters together to get unique effects. Perform the same filter chain again by choosing "Last Filter" or save your filter as a preset for later use. Vector shapes let you make squares, circles and lines, but keep the flexibility of changing things later on. Don't like the color of the border? Swap it out. Do you want to make that rectangle have rounded corners after you've made it? Don't worry about it, just click some buttons and it is done. You can also scale vector shapes easily without having to stress about the shape getting pixelated or looking funny. Acorn makes adding shapes to your image a breeze. 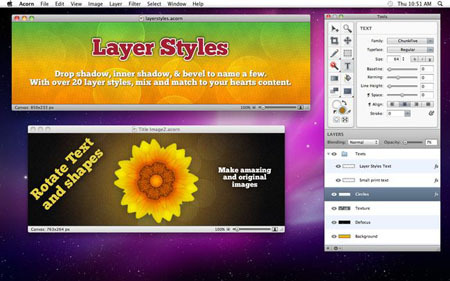 Acorn makes it easy to create mock-ups and work with screenshots. As long as Acorn is open, press the Command-Shift-6 keys while in any application,and Acorn will make a screenshot of your whole screen. Your image will be brought into Acorn immediately, ready for work. You can even turn on a preference to make every window in the screenshot its own layer. Use this in combination with the vector and text tools to create amazing mock-ups quickly. Make different shaped selections, invert them, feather, even add a corner radius. Or, if you're looking to quickly select an entire color, try using the Magic Wand for some quick changes. Selections can also limit the effects of filters and adjustments. If you have a picture that is a little dim in the corner, try selecting it, feathering the selection, and bumping up the colors using the Levels command under the image menu. Acorn supports many file formats, but when you need to get that image size smaller and still looking good for the web, take a look at Web Export. Acorn provides an estimate for the export file size and lets you compare the compressed version to the original. Acorn goes all the way up to 64. Bits that is. And along with running on your computer's 64 bit Intel chip, Acorn utilizes your graphics processor unit (GPU) for additional graphics power where appropriate. Less waiting equals more time creating. Requires Max OS X 10.6.6 or later. Acorn 3.5.1 Mac Os X Fast Download via Rapidshare Hotfile Fileserve Filesonic Megaupload, Acorn 3.5.1 Mac Os X Torrents and Emule Download or anything related.